Hey guys, thanks for visiting my website again! In the summertime I am not in my studio that much because I like to go outside in the summertime as well, to work in my garden, walk the dog or just be with friends and family. Also I like to go scuba-diving or mountain biking every now and then. In the last couple of weeks I did some vocoder stuff for Areo51, Cyberspace and Oblivion. Also I did a track together with SynthOne under a new project-name called TryTone. We try to work together a bit a make some new music. There is a demo on Soundcloud if you want to hear it. In my studio there have been some changes; I bought a Roland MKS-70 and managed to get some very interesting sounds on an M-64C cartridge delivered to me by Karel Post (Lone Starr) which contains sounds from MvdK, or so the myth goes… but I asked Michiel this and he can’t remember him selling his old MKS-70 to Karel. 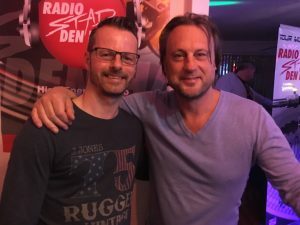 Yes, you read that right, I finally got a chance to meet Michiel van der Kuy in person and had a nice conversation with him 🙂 I was in the Radio Stad Den Haag studio at the release party from Marco Di Luna’s album Shimmering Stars and so was Michiel. We had a nice chat about gear, music and live in general. It was nice to meet him at last. So whats next? I don’t really know… I am also thinking about doing more in other music-genres. Don’t get me wrong I like Spacesynth a lot but I also like Synthpop, Italo and even Trancemusic. So maybe I will start some projects under different names. So, there wont be much news this summer, but probably I will start producing another album in the autumn. This is my attempt to recreate this epic Laserdance classic as close to the original as possible with my gear and equipment. I used Logic Pro X, Roland Juno 106, Roland D50, Yamaha AN1x and Linndrum and ESQ Wavebell samples in Logic. For this cover I also used a tape saturation plugin in Logic to get that 80’s sound and I even mixed in some vinyl static noise for your pleasure! I hope you like it as much as I did making it. Eurodance Edition: I made this demo just for fun, I hope you like it. I used my Korg M1, Roland Juno 106 and Logic Pro X.
I made this cover on special request by Piotr Wolk, I hope you like it. On special request, the making of my Donna Summer – I feel Love Cover 🙂 See my workflow as I recreate this track. This is my synthesizer cover of Donna Summer – I Feel Love. I have made you a videoclip with some old footage and nice pics of Donna and Giorgio Moroder. The track is created with Logic Pro X. I used my beloved Roland Juno 106 for the bassline. For the drumsounds I used my Roland TR-8 and all other sounds are from Logic. No MIDI and No styles are used for this track! All basslines and melody’s are arranged by me. The video was rendered on iMovie. I hope you enjoy it!